Fino Rodriguez has created a tiny gem that will draw even more people to West Dallas. I dream about the ceviche, possibly the best ceviche of my life. The style is creamy, from Taquero owner Fino Rodriguez’s region of San Luis Potosí, where they favor the bright tang and bite of lime contrasting with the soothing influence of mayonnaise mingled with herbs, Mexican oregano making it sing. Add a squirt of hot sauce; eat it with spoon or chip. You can tell it’s going to be good even before taking a bite. It’s a cool-looking thing with a fan of avocado slices served in a swimming-pool blue plastic bowl, and it’s perfect. The address is on Singleton, though it really should be on Chihuahua, the street from which you approach the taco stand, barely bigger than a food truck, with its one counter from which you obliquely see Rodriguez at work in this neighborhood where tiendas are nestled among the houses. He developed the menus for Mico Rodriguez’s Mesero restaurants and now runs his tiny business with the attitude of someone who doesn’t know how special it is—simple, unpretentious, with authenticity deeply anchored in his region. Blue chip: Rodriguez’s top-notch menu, posted on the outside wall of his tiny taco stand, includes a creamy ceviche and a special with blue corn masa. You will probably come at least once on a night when they are out of the lengua, so tender as to deserve being mythical. Try the tripas instead. Don’t be afraid. It’s marvelous, griddled with just enough chorizo to form a crust that gives it an extra meaty depth. The menu is small but diverse. There is a fish taco, with pretty purple cabbage and a fresh green jalapeño ranch; phenomenal achiote-rubbed chicken; carnitas. The latter has thick, soulful hunks of pork, though none of the crumbly bits I associate with truly great carnitas. There is also a torta, one of several more substantial items in the $5 to $8 range. The El Machete, a glorious, bronzed monument, essentially a steak quesadilla, with the slaw tucked inside. And they serve breakfast items. El Come has the only taco in town stuffed with grasshoppers. The spit-grilled signature, as you might guess, is spectacular. Tuesday special features pork chicharrón-encrusted cod. This vegetarian stunner also has crispy kale, pepitas, and lemon-epazote aioli. 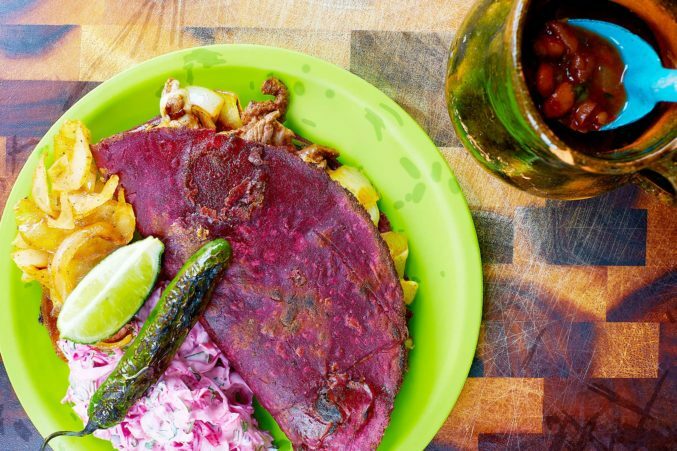 No one tells you the Olmeca will be a blue corn beauty, filled with Oaxacan cheese and grilled meat, the smokiness from guajillo and árbol chiles and cumin and the grit of the corn somehow as ancient as the culture for which it’s named. (The corn is sent specially from San Luis.) There are other surprises. The fried Brussels sprouts are like nothing else—soft inside, crispy outside, with a riot of hot sauce and the startling tartness of hibiscus blossoms, chewy and with a sweetness that marries with the caramelized pineapple in little chunks. The hibiscus agua fresca, deep maroon, is served with lemon wedges and raw jalapeños that sink to the bottom and make the last dregs spicy with a deep heat. They are all part of what’s different and special. Is everything perfect? Of course not. Are the vegetables sometimes oily? They are. But the bright, fresh flavors are singularly appealing and the sauces terrific, from the velvety golden habanero to the spicy, cilantro-flecked verde. While Rodriguez has help with serving, things take time, as they should. This is when the frijoles de olla may come to you in a handled mug of glazed terra cotta with an enameled tin spoon. It’s a gesture of hospitality that surprises you the first time you take a perch to wait. And so it continues to be a hub of humanity on a pleasant evening. You feel lucky. Stand up. Pay cash. Wonder if Rodriguez knows what a special thing he has.